Portable Document Format (PDF) is a file format used to present and exchange documents reliably, independent of software, hardware, or operating system. We use PDF documents because they look exactly as we intended and can be viewed on a broad range of hardware, software and operating systems. This great “function” became a great “hassle” when few years ago boom of mobile devices happened. PDF can be viewed on small screens but constant zooming and scrolling from left to right is not a very good user experience. Responsive Web Design is about using HTML and CSS to automatically resize, hide, shrink, or enlarge, a website, to make it look good on all devices (desktops, tablets, and phones). 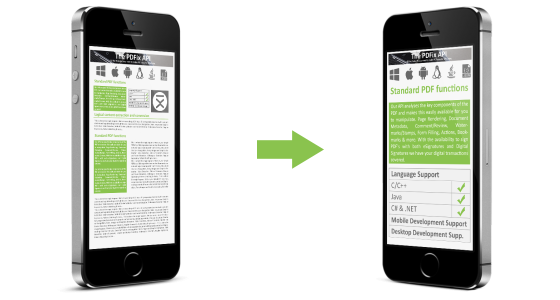 PDFix API is capable to extract all content from original, flat, untagged PDF document and create responsive HTML document(s) which can be automatically resize to the any size of screen, simulating responsive PDF behavior on a mobile devices. PDF to HTML conversion through PDFix API supports two outputs. Original Fixed layout preserves original formatting with pixel perfect page rendering, original graphics, transparent text aligned with PDF text position and dynamic zoom support. Responsive / Reflowable layout is true responsive HTML page which reflow PDF text, tables and other original content. It will automatically fits different page or screen width and is perfect for any handheld device. This technology can be used to improve user experience when working with PDF documents on mobile devices or even on a desktop computers. You can build web pages with embedded PDF, mine for data in PDF with hyper- accurate extraction and last but not least you can also rebuild AcroForms into a responsive design so that your users can fill out PDF forms directly on their mobile device in a clean and simpler way. You can learn more and download trial from PDFix API here. Request your Price Quote here or contact the BinaryNow team by completing this form.